There are many a tapa joint in Barcelona, Spain. Some only offer cold tapas such as green Spanish olives stuffed with anchovies, canned muscles, and salty sardines. Others offer tapas in a stand up, buffet style, where customers grab tapas from a communal bar with their fingers. And then there are sit down places like Bodega La Tinaja, where customers can enjoy a wide array of hot and cold tapas and pinxos. La Tinaja is a place that I take people who come to visit me in Barcelona from out of town. It has a lot of what I call ‘wow’ value. The entrance into the restaurant is an ancient and enormous wooden door, that could very well be the original door to what was once a storeroom and bodega (cellar) for the nearby church. Inside La Tinaja it is dark and charming. Ceramic wine and olive oil jars line the walls and it is easy to imagine what La Tinaja was like a few hundred years ago before it was converted to the fine eatery it is today. La Tinaja has a fantastic selection of Spanish and Catalan wines. 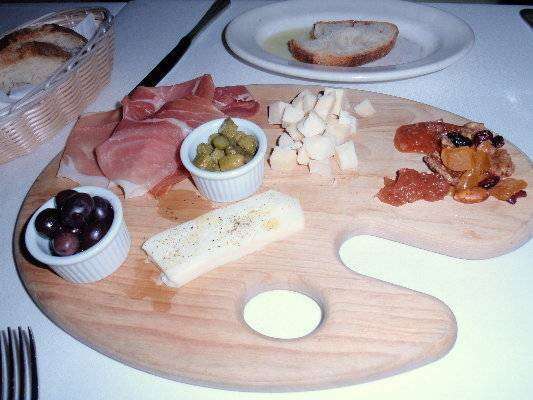 It also offers many types of Catalan cheeses, dried sausages (an important food from the region) and olives. Make sure to get a portion of Pan con Tomate (bread with tomato) to go with whatever other tapas you try at La Tinaja. La Tinaja is mid-range, and how much your meal costs depends a lot on how many tapas you get and what sort of wine you order. 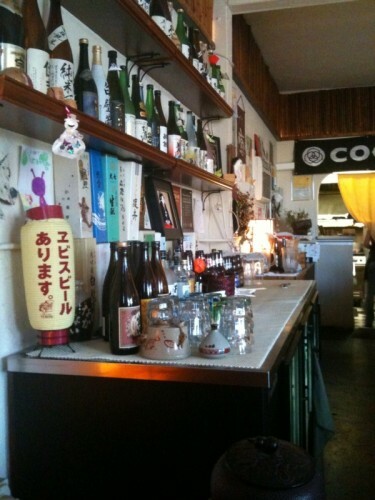 The sake bar at Yu Me Ya Sake House. We’ve since become regulars – well, as regular as anyone can be at one of the worst “best-kept secrets” in SD County. Get there after 6:00 on any given night and you’re out of luck. 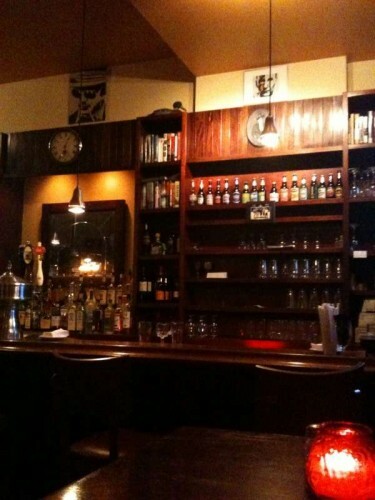 The place is small; the bar seats maybe 12 people, and there are only a handful of tables. And it’s always packed. For good reason. The sake list boasts well over 100 different sakes, which can be purchased by the glass or the bottle. Newbies to sake are advised to try a flight – three 1 or 2 oz. glasses of either regular, premium, or super-premium sakes. Prices range from $5 to $14 per flight; it’s best to let Yuka or her sister Fumika pick for you (they’ll invariably recommend a sake that was the favorite of a particular Japanese Prime Minister – I have no way of verifying the accuracy of their claims, but I’ve yet to be disappointed). Sake is not a distilled “hard” alcohol; it’s sipped like wine, and good sakes have the complexity of a good Cab or Pinot. I found some amazing flavors in each glass – licorice, bourbon, citrus – that simply aren’t found in the stuff that you buy at your local chain grocery store. (And like good wine, drink a few and you’ll get a tremendously pleasant buzz.) On our last visit, this past weekend, I enjoyed…well, I couldn’t tell you the names of each sake, but they were all delicious. (Of course, at the end of the evening, I probably wouldn’t have been able to tell you the names of my kids.) In addition to sake, Yu Me Ya serves some excellent – and unusual – Japanese beers. 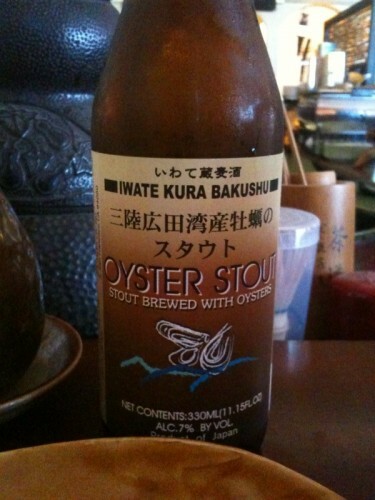 Iwate Kura Bakushu Oyster Stout. Yes. It's made with oysters. Yu Me Ya has an excellent menu; the udon is legendary, and the hot and cold izakaya – Japanese tapas – are amazing. (Best bets – the spicy tuna “carpaccio” and the takoyaki, fried dumplings filled with diced octopus, and the BBQ beef salad.) But the sake is the reason to come here. Diving into Japan’s signature beverage is a treat, and Yu Me Ya is the perfect place to discover what real sake is all about. Somorrostro is down by the sea. 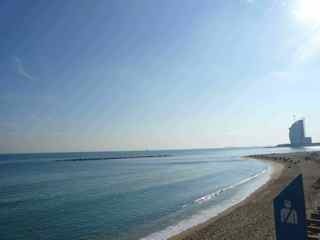 Somorrostro is down by the seashore, in Barcelona’s seaside barrio, La Barceloneta. However, it is not what you may be imagining. At this small and cozy restaurant, there are no Mediterranean views, no open-air terrace for dining on summer nights and no palm trees swaying to the soft breath of the Spanish breeze. Nope, Somorrostro is not your typical beach restaurant, but it is fabulous. Let me tell you why. First of all, it’s creative. I love the name, which comes from a Gypsy settlement that used to be set up in La Barceloneta. This settlement was called Somorrostro, and though nothing of the settlement remains, its history lives on. La Barceloneta was (and in some ways still is) a poorer, fisherman’s neighborhood. The houses here are small and compact, with laundry drying from windows and in the streets, which are narrow and filled with neighbors walking dogs and gossiping. Somorrostro sits on a corner of one of these skinny calles, open daily for lunch and dinner (closed on Tuesdays). Every evening Somorrostro offers a special 3 course meal for 14 Euros, including wine. You have to come early to take advantage of this deal, and you can’t make reservations for it. Aside from the special, Somorrostro Chefs select fresh ingredients from the market each day, and then design the menu around what they have found. Daily dishes are written on a large blackboard and the waitress comes over and explains the evening’s offerings. Though the ingredients are local and many of the dishes are typical Mediterraneans or Catalan specialties, Somorrostro is gourmet and puts its own unique twist on these traditional plates. Tapas at Somorrostro is a whole new experience well worth trying out. Whatever you order, you are sure to get something both innovative and delicious. The best way to explore Barcelona is to wander it. 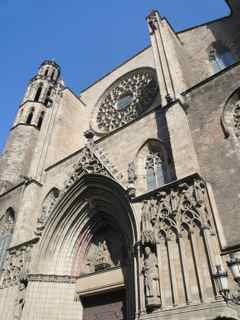 Put your map in your pocket, and head into the Barri Gotic (Gothic Quarter) of the city, turning when it feels right, onto deserted pedestrian lanes and curving alleyways. Get off the tourist track and get lost. (You can’t really get lost for too long in the Barri Gotic, it’s too small). When you get to know Barcelona this way, you will end up in its best bars and restaurants. Hidden on side streets, the city’s eatery gems await you. Onofre Wine Bar (Vinos y Viandas) is one such gem. A couple blocks from the Cathedral, Onofre is overlooked by tour groups and day-trippers from the cruise ships. 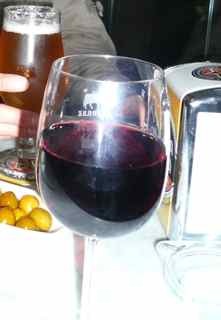 A wine bar, this is the place to head to try your favorite Spanish or Catalan wine. Onofre also has a huge cheese menu. They import cheeses from all over Spain which range from pungent to mild, aged to fresh and creamy. There may be few greater pleasures than a cheese plate, a glass of Rioja wine and a bowl of Spanish olives after a day of wandering around Barcelona. Put it on your Barcelona to-do list between ‘See Sagrada Familia’ and ‘Visit Port’. Apart from cheese, Onofre also has a large selection of tapas. Chicagoans plagued by cabin fever and nature lovers alike, flock to the charming respite of Galena, IL. Located about 160 miles from Chicago, Galena offers a nearby,lovely, pastoral getaway. Nestled in the rolling hills of Northwest Illinois, Galena is filled with historic French Colonial and Victorian architecture, art galleries and specialty shops. The small town also supplies a host of outdoor activities including horseback riding, fishing, hot air ballooning , ice skating and skiing. Noted for being the home of Civil War hear and 18Th president Ulysses S. Grant, a visit to his expansive house is a Galena must-do. Tour Galena’s largest and most elegant mansion, Ryan Mansion, built in 1876, for a peek into Victorian life. Take in the winter art show at Stone House Pottery & Gallery for an exhibit of oils, water colors and acrylics by artist Dwight Walles. Join the spirits on the “All About A Ghost Tour ” at Galena’s oldest hotel, De Soto House Hotel and hear authentic stories about Galena’s ghostly past. Relax at the Massbach Wine Tasting and sip estate wines from Massbach Ridges 18 acres of grapevines. Top off your adventures at Miss Kitty’s Grape Escape Wine & Martini Cosmopolitan Cocktail Lounge and take in some live local music. Unwind at Bernadine’s Stillman Inn, located in a historic Galena mansion. Downtown Providence, Rhode Island is filled with Italian restaurants. With that many options it is challenging to find something unique. But I think I may have done just that by venturing over to the College Hill neighborhood – just across the river, down the road from RISD and Brown University, overlooking the city skyline. Bacaro is its name and personalization is what makes it special. 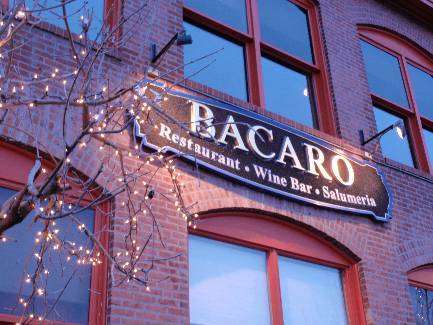 Bacaro combines a wine bar, salumeria (meat shop) and restaurant under one setting, yet the mix between college, families and couples commingles seamlessly. It helps that they have two floors with different atmospheres to seat various patrons. Downstairs is the wine bar – which is an official Enoteca, meaning they have over 100 different varieties from a specific minimum of regions throughout Italy and France. The bar area is small, because the downstairs also is comprised of restaurant seating trending towards vibrant groups of families or friends. And on your approach to the upstairs, the Salumeria displays all of the available cheeses and meats freshly cut as ordered along with oysters, spreads and snacks of the Italian variety. Upstairs the environment is more intimate in feel with dark exposed wood beams and candlelit tables. 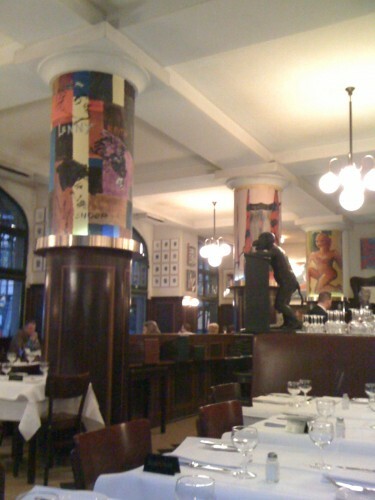 And although there is an open kitchen with chefs and staff hard at work, the noise is not overwhelming or distracting. The personalization extends beyond the various seating environments to suit your party by offering unique access to the Salumeria. Our server presented us with a formal menu and wine list, but also handed us a paper list of all the salumeria items and descriptions of each along with a little golf pencil. Confused, we thought perhaps we had to pass some type of test in order to have a meal! But no. Our server kindly explained that we could go through and check off the box next to any item that struck our fancy and they would be served on a board to be consumed either as an appetizer or enough to share a meal. Or we could bypass them altogether and go the traditional route by selecting from a menu of pre-selected appetizer samplers and meals. Since it was a special occasion and our first time there, we decided to sample the entire gamut. The cheese, olive and meat variety that we put together was presented nicely with an array of sweet marmalade and almond spreads and tart pickled sides. Not to mention the tasty bread that lived on our table from start to finish. My husband couldn’t resist the soup special of beef barley which came with a pasta noodle curled on top for decoration and texture. Warm and delicious! We skipped salads and continued on to our main course – swordfish for him and pasta for me. These were not easy choices since the menu is extensive and runs the gamut from pizza to duck. The swordfish was prepared in a light red sauce with rice and was tender and flavorful. 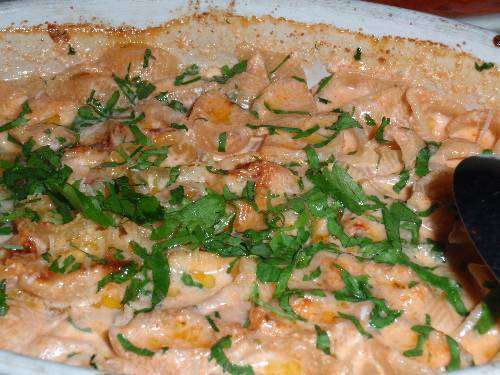 The baked gratin of pasta contained five different cheeses and a creamy pink sauce which was still bubbling when the dish was served. The pasta was the perfect consistency and the dish was absolutely delicious. It was large enough for two, though I was delighted to have extra to take home. We capped the evening off with the molten chocolate peanut butter cake served with ice cream and peanut brittle. Many of their deserts are made as ordered rather than in bulk in advance, so you have to order them when you select your main course for them to be ready when you are. I never have a problem saving room for desert so having to decide before my meal was really not an issue. This moist little cake with an oozing center of liquid chocolate was a warm and rich piece of heaven. The staff was courteous and attentive, though they did not ask us if we wanted any coffee with our desert (which it turns out, we did not). Other than that I could find nothing wrong with the entire evening, aside from the price. Be forewarned that all of this personalization can get expensive fairly quickly. The entrees run between $20 – $30 a pop. 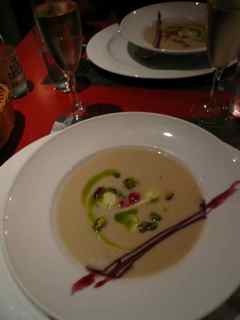 Deserts and soups were about $12. Salumeria selections were about $7 each. But if you are looking for a unique Italian dining experience with family, friends or to impress someone special do consider Bacaro’s. 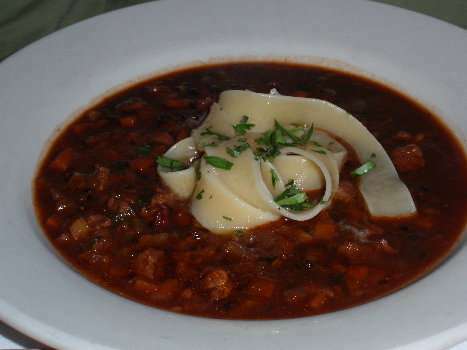 It is the perfect restaurant to please those with varying preferences in types of food. 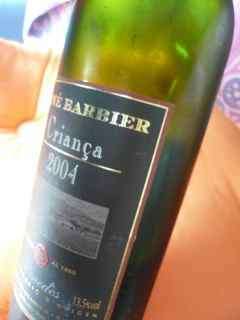 The environment, wine selection, food quality and service are all excellent. The restaurant supports and uses local farms so the menu items are always fresh, though consistently changing. And the view from upstairs looking across the water to the city skyline is a nice touch too. My first trip to the Big Apple, and I was running on fumes. I’d been there for 72 hours, and in that span I’d seen Times Square, the Brooklyn Bridge, Battery Park, Wall Street, a couple of Villages, a bit of Chinatown, some of Central Park, and all of the Met. (That’s a lot of statues, people.) I also managed to squeeze in some actual work. Oh, and there was a snowstorm. I had one last night in the city. And I needed a drink. I was meeting up with a couple of fellow writers, Nathan and Matt from the urban dad collective DadWagon. Nathan had suggested the Hudson Yards Cafe, a gastropub on the fringe of Hell’s Kitchen. Beth and I took a cab from our Times Square hotel to 10th Avenue. I was a tad nervous – Hell’s Kitchen conjured up images of Irish mobsters and Daredevil comic books. The bar at the Hudson Yards Cafe, well stocked with booze and books. My fears were, of course, unfounded. The Hudson Yards is a quintessential neighborhood bar, a regulars’ joint with a small but distinguished trio of beers on tap (Guinness, Stella Artois, and regional favorite Yuengling). The food’s a mix of happy hour favorites – we dove into a plate of fried artichoke hearts, and chased those with some excellent hot wings and calamari rings – and more sophisticated bistro fare. The bar’s fully stocked, and the wine list looks solid. The walls are adorned with show posters and photos of celebrities (I geeked out over the photo of That Guy actor Clancy Brown – you know, that guy who played The Kurgan in Highlander and the main guard in The Shawshank Redemption – and was please to see a print of Hunter S. Thompson hanging prominently over the bar). And the bookshelves placed between the liquor racks are a quirky touch. The crowd was sparse at first – there was a small group next to us playing a dice game, and a couple of guys watching Olympic curling on the TV. But it filled up quickly with the post-work crowd. One hears so much about New Yorkers – hard, rude, mean – but during this trip I found the opposite to be the case, and the Hudson Yards patrons and staff were all smiles and cheer, even after a long snowy day. I ordered a Bombay martini and enjoyed the warm vibe, hoping it would carry us along. We had a few more stops to make, and it was going to be a cold night.